eAfter being attracted and pulled to Gasgas by the new revolutionary white 250 Delta prototype Lluis spent much of the year with Andreu Codina developing this new model . The GasGas offered Lluis the future in the form of the first GasGas watercooled engine. This was seen by him as a significant step forward and he wanted to be part of it. Months and months of development followed . Everything on this new model was different from the previous Aire model , and the rush to production had exposed little gremins which needed ironing out . It was one of Lluis's roles provide this feedback to the factory. It is on record from several senior GasGas figures and engine mechanics that the first Delta (white)was the most expensive to produce GasGas , the company has ever produced . If you have ever removed the plastics from one of these white 250 Delta models , you can see why . The airbox is fibreglass with metal fixings integrated into it. Brackets are here and there , mounted from the frame to route pipes and hold brake fluid and coolant containers. The plastic petrol tank has inbuilt metal components. Nothing was easy with this model ...it was a fight from day one ....and it was Lluis and Andreu who were doing the work to sort it out. 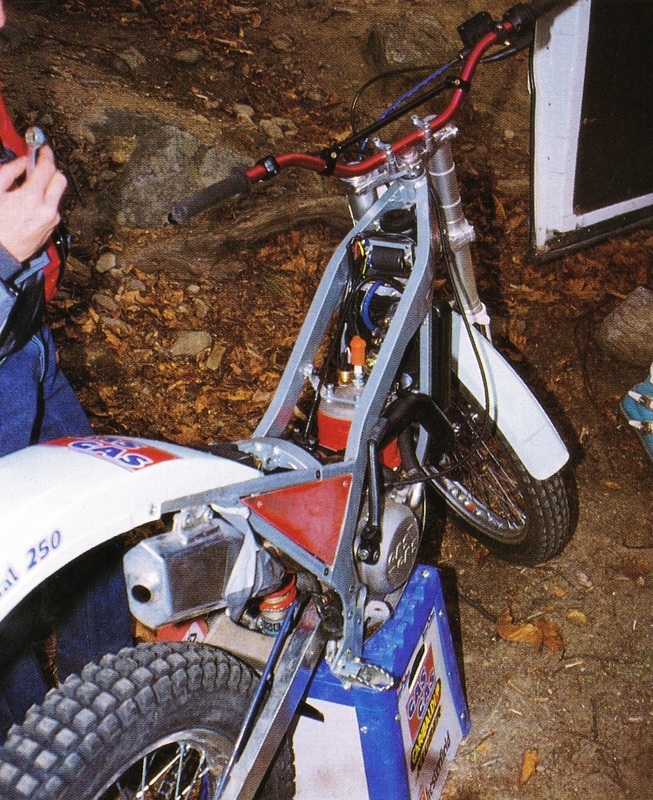 Don't mistake the 250 white Delta as being a normal production bike . Its not. This is a true low numbers factory bike , built at high cost ,in the name of development.It cannot have earnt the company one peseta . 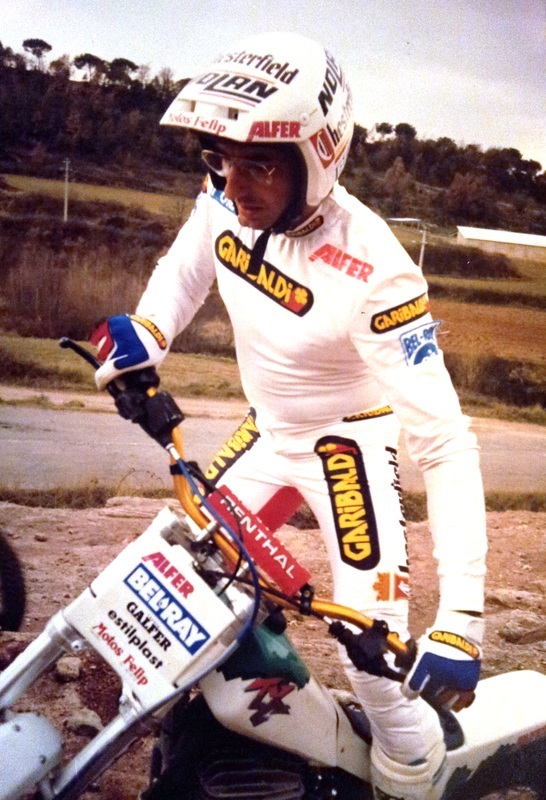 The sad part was , that at the end of 1990 and with just one year under his belt with GasGas the young and upcoming rider Amos Bilbao from Austuris was hired by the factory , and Lluis' services were no longer needed. This photo of Amos was taken at the very moment the announcement of his move from Fantic to GasGas was made. 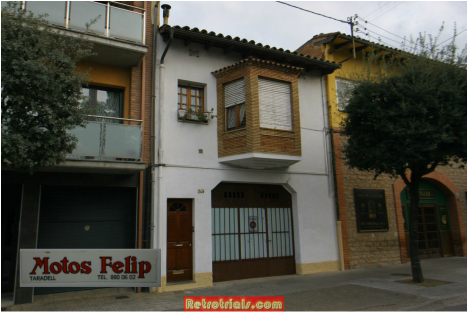 The 2nd photo shows Felip's old shop where the Alfer prototypes were made and Lluis's bike was serviced. It is now a house. After I leave Alfer I do not know what happened to my bike"
Did you read that last line from Lluis ? "After I leave Alfer I do not know what happened to my bike"
﻿This is a side effect of Retrotrials OCD. A side effect of getting a lead , like a worm in my head , that i cant shake off. In the past few years Retrotrials has seen perhaps 3 Alfer TX300's in collections. 2 in Barcelona and near Bilbao. 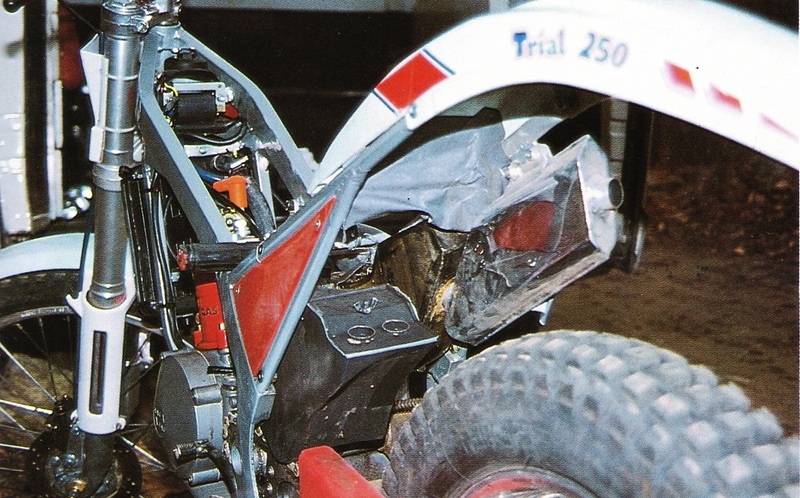 In all of these cases the owners claimed that their bike was the bike of Lluis Gallach. But , of course this cannot be the case. Not every bike can be the bike of Gallach. This its the same with the Dragonfly. Owners have the same dreams . Someone is correct ...but they cannot all be correct. These claims usually dont come with any documentation to back them up , and so they have to be treated as a normal bike. This is just common sense. LLuis only had one Alfer each year. What a line up ! , with Gallach 2nd from the left on the Alfer TX300. Can you name them all ? Why wasn't Jordi riding ?. 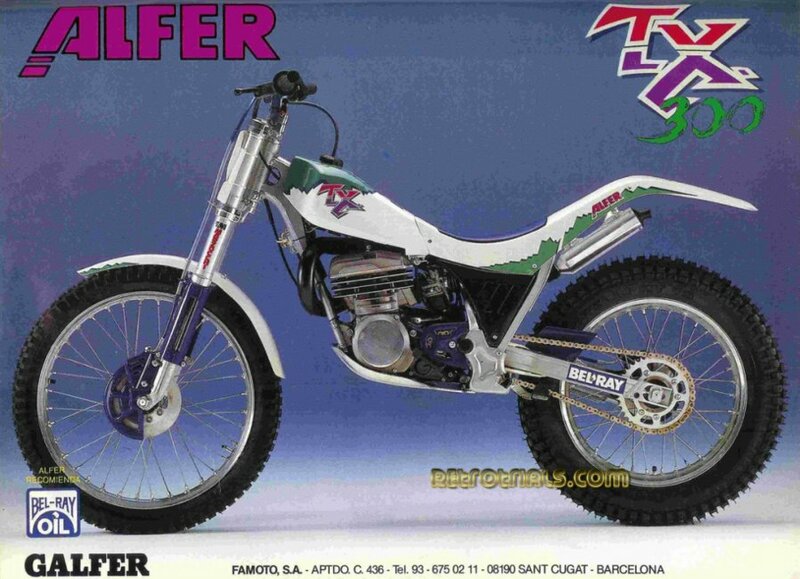 Well......with my usual sense of caution the Retrotrials team was invited to see the "real Gallach Alfer" TX 300 bike from a man who said he was part of the team that created and designed the Alfer and Scorpa bikes along with Francisco Almirall. So we telephoned Felip Gonzalez up and it all sounded very genuine and true. He had photos and documents to back this up , because of course i was a little cautious to believe such a claim. But the claim of Felip was sounding very convincing , so i hopped on a plane and went off to Barcelona eager to see the bike. Why the rush ?. Well i had heard that the bike was being sold and perhaps the bike might disappear or the new owner might not want this report to appear. So like a flash of lightening i jumped onto Sleazy jet and i was there with my Retrotrials chums for another adventure. These photos are from a test carried out by Moto Verde magazine . 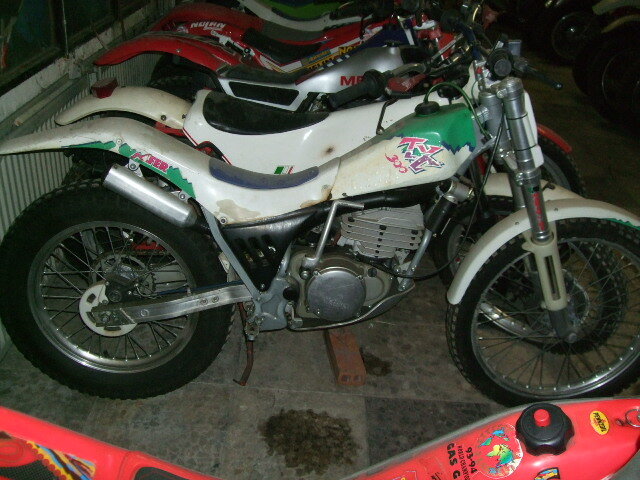 This is a stock bike for the test and not the factory bike of Gallach. There are some subtle visible differences .